In the thirty-third thrilling escapade in Piers Anthony's rousing Xanth fantasy series, an adventurous arachnid named Jumper must assume human form to save the enchanted realm from a cosmic peril. A cataclysmic battle between two all-powerful Demons has severed a mystical connection that joins Xanth to our own world. The key to restoring it is hidden within a cryptic prophecy that Jumper discovers when he is suddenly transformed from spider to man. As he sets out to discern the prophecy's meaning, he gathers about him a half dozen alluring damsels who do their best to help him solve the riddle while vying for his attentions. But a seductive siren and her demonic consort have determined to use their wiles to lure Jumper and his lovely companions away from their urgent mission. In a madcap adventure that is alternately harrowing and hilarious, they soon discover that danger, deception, and even true love may be found where they least expect it. 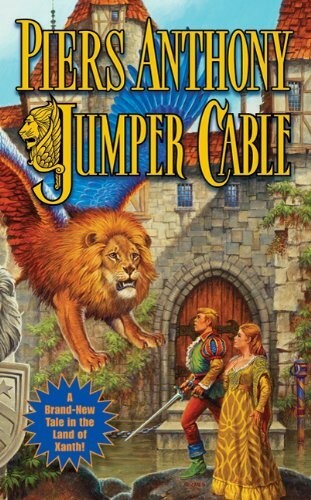 In Jumper Cable, master storyteller Piers Anthony spins a wild and witty web of wonder that is sure to captivate fans of fantastic adventure everywhere!